Here’s a sad fact about the growing elderly population: While the rest of us get more connected by using social media such as Facebook and Twitter, sending streams of photos to each other using services like Instagram, and using text messages to exchange bon mots, senior citizens who aren’t savvy to the latest personal technology are becoming increasingly isolated. The more millennials use text messaging, the less they communicate with people who don’t know how to use a smartphone or tablet. That’s why the GrandPad tablet is such an interesting product. It’s just a Nexus 7 tablet at its core, but it runs a customized version of Android that’s designed specifically for older users. A wireless charging stand, a cover, and a stylus are included in the package. 4G connectivity (Verizon LTE) is also included, eliminating the need for the end user to have a router, broadband Internet access, and the skills to install and maintain the same; plus, they can take the tablet almost anywhere without the need to look for and connect to a Wi-Fi hotspot. And the tablet is insured; so if the user loses or breaks the device, the manufacturer will send a replacement at no additional cost. This is the first of GrandPad's three home screens. Note how the icon on the right overlaps the bezel, and the presence of a large arrow button telling the user there are more functions to see. I decided to test one with my dad, who is in that “super senior” demographic that GrandPad's management says its targeting. The company has put in an amazing amount of effort to ensure that the tablet works for people over 75. First, the stylus is important because super seniors tend to have more leathery fingers and can’t use a touchscreen as easily younger people. And the interface is about as simplistic as the kid-safe mode on an Amazon Fire HD Kids Edition. The homepage is spread over the area of three screens, with large arrow buttons informing the user they need to scroll left or right to see more buttons. 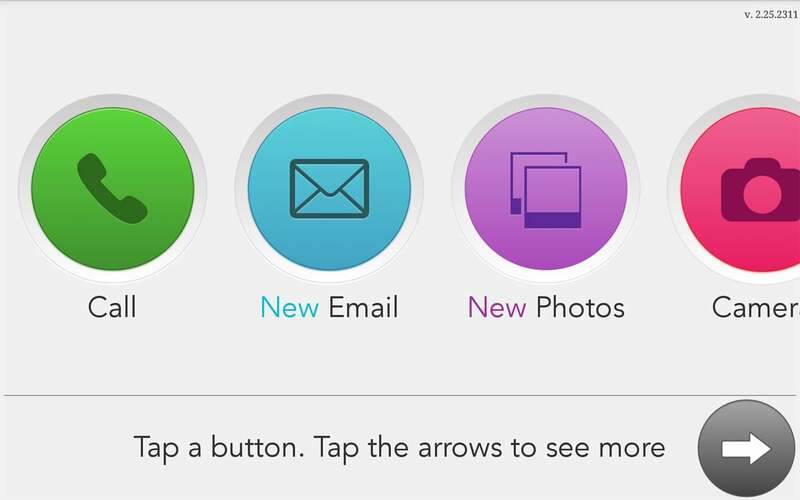 Larger and more brightly colored buttons identify the primary functions: Phone calls, email, photos, camera, weather forecasts, music, games, search, and help. I’ll cover each of those features in a moment, but I’m mostly impressed with how the company supports its user base. When a senior first receives the product, there’s an onboarding process where someone trained to work with older folks walks the senior through each feature. This typically occurs over the 4G connection, but an in-person orientation is in the realm of possibility if a customer-service rep happens to live nearby. Either way, it’s more than just a training session. The rep will find out which songs the senior likes and will load them onto the tablet, set up contacts for family members, and will even configure the GrandPad so that it harvests Facebook and Instagram photos and videos and automatically loads them into the tablet. In my case, the rep spent time over a several-day period teaching my dad how to use the GrandPad. You can also set up another family member as an admin, so they can manage the tablet. There’s even a calendar that tracks which days the GrandPad gets used the most. Yes, it's just a Nexus 7 at heart; the real value proposition here is the software and service. I’d forgotten all about the GrandPad’s Facebook-feed feature and took photos at a recent auto show. My dad called to tell me he liked the pictures I’d taken of the new Bugatti on display, and I suddenly realized he was being included in my day. He sent emails by recording his voice. It was amazing, given how little my dad understands technology, that he enjoyed using this device. You can make video calls to and from the GrandPad, thanks to its 4G LTE connectivity. 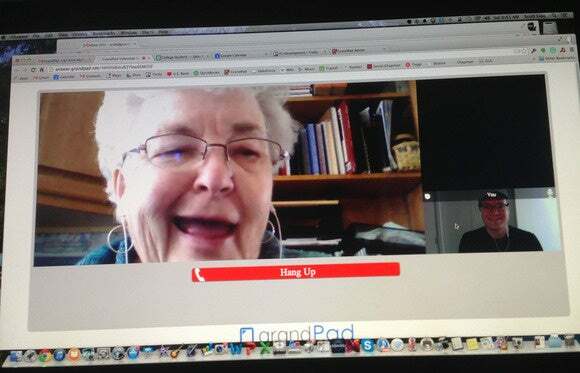 Family members can use the GrandPad companion app on an iPhone or Android device to call the senior (by voice or video), send email or text, and upload photos and videos. When you add these, every other family member in your network will see the same uploads. The GrandPad is locked down so that the user can call anyone using the 4G connection, but the tablet will block incoming calls from unknown numbers. It also doesn’t have a web browser, which can be considered a shortcoming on the one hand (seniors enjoy the web as much as the rest of us) and a boon on the other (it enhances the tablet’s data security and limits the risk of malware and virus infections). Bottom line: The ability to load the GrandPad with pictures and videos of the grandkids is an amazing way to include the elderly in social networking without forcing them to learn how to use social media. A GrandPad costs $60 per month, but the first-month’s subscription fee is the only upfront cost and there are no long-term contracts—you can cancel the service at any time. I won’t quibble too much on the price, since it includes incredibly strong customer service and an unlimited 4G data plan (although the absence of a web browser is a de facto data cap). Now if the GrandPad could operate as a Wi-Fi hotspot when family and friends come to visit, it would be an even better value, but I don’t expect to see that happen. 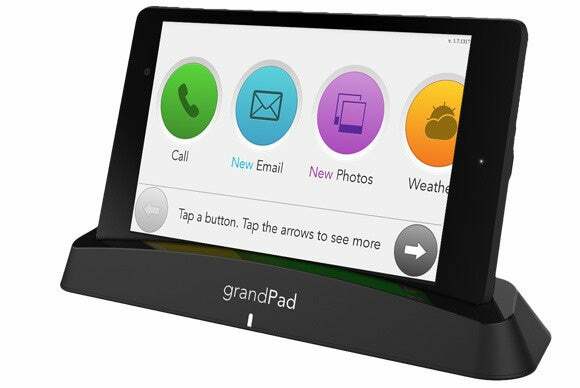 This story, "GrandPad Senior Tablet review: This easy-to-use device can help families stay connected" was originally published by TechHive. 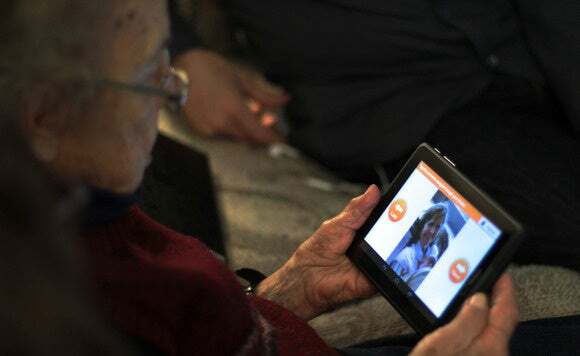 This specially designed tablet is optimized for seniors, helping them stay connected to family and friends. Tech-savvy users can include seniors in their social-media activities without having to do anything different or special.